What 3 Things Remind You of Switzerland? This is a sponsored post as part of Ricola Original’s 75th Anniversary celebrations. I loved watching Heidi as a child. Looking back it’s now obvious I’ve always been drawn to the simple pleasures in life. Wooden cabins, open log fires, good wholesome food, spring water, fresh air and mountain scenery that stretches as far as the eye can see. I’m actually humming the theme tune to the 1978 mini-series while typing, and a lesser known fact is my daughter could easily have been named ‘Heidi’, it was on the short list. Mountains. Mountains. Mountains. Yes I adore mountains. They represent all of Mother Nature’s qualities I admire so much. Beautiful, strong, awe-inspiring, natural, and frequently being covered in snow works for the natural-born skier in me. I have visited the Swiss mountains once, not to ski and in rather unconventional circumstances and outerwear. 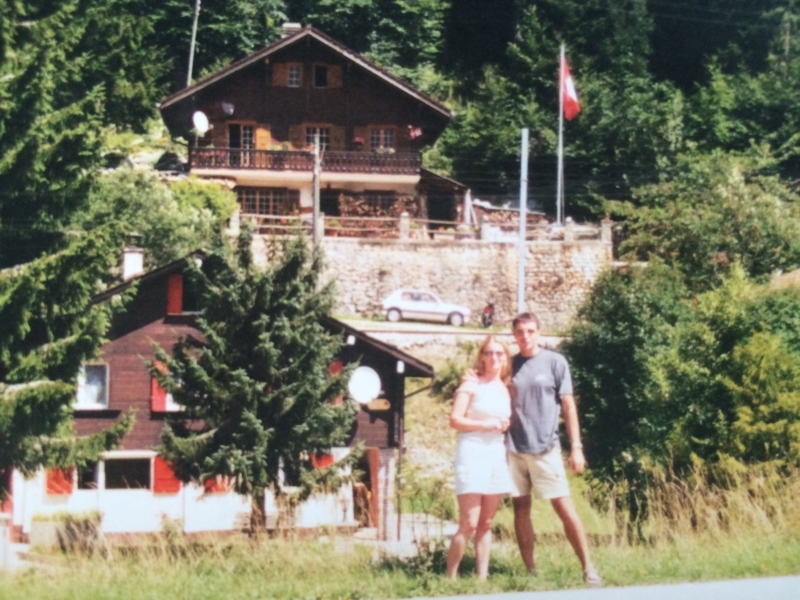 …on my honeymoon, after spending a night sleeping in the car outside a train station in Bourg St Maurice. We’d spent the previous day in sunny France, hence the shorts. It was a little cooler at 7am, the following morning, standing under the Swiss flag. This is a sponsored post, but you know me well enough to be assured that I never blog about anything I personally do not use or recommend. Now considering I like things to be kept simple and wholesome, Ricola is the perfect sweet. And by getting involved in their celebrations it gave me the opportunity to find out a little more about the company whose products I have enjoyed over the years. You can imagine how excited I was when the postie arrived with a wooden box filled with Ricola sweets and an invitation to join in with their 75th anniversary. I actually stroked the box, yes I know, I just admitted that. Founded in 1930 as Richterich & Co. the company’s headquarters are still based in the picturesque town of Laufen in the northwest of Switzerland. (I can just imagine this town – sounds idyllic). Ricola`s entire production process still takes place at the original location. All Ricola products are based on the original and legendary 13 herb mixture, which are naturally grown in the Swiss mountains. The herb specialities are known for their soothing and unique taste. (The sweets I received were very much appreciated as I’ve had a sore throat hanging around for almost a week now). Happy 75th Birthday Ricola Original! The herb drop hasn`t changed since its invention in 1940 on the basis of its unaltered taste, effect and shape it is a truly unique product and remains a bestseller for Ricola ever since. This top-secret 13 herb blend also forms the foundation of all other flavours of Ricola sweets. More information about Ricola Original drops here. To celebrate their 75th anniversary, Ricola have also produced an Original Herb made of real gold, which you have the opportunity to win in a sweepstake! 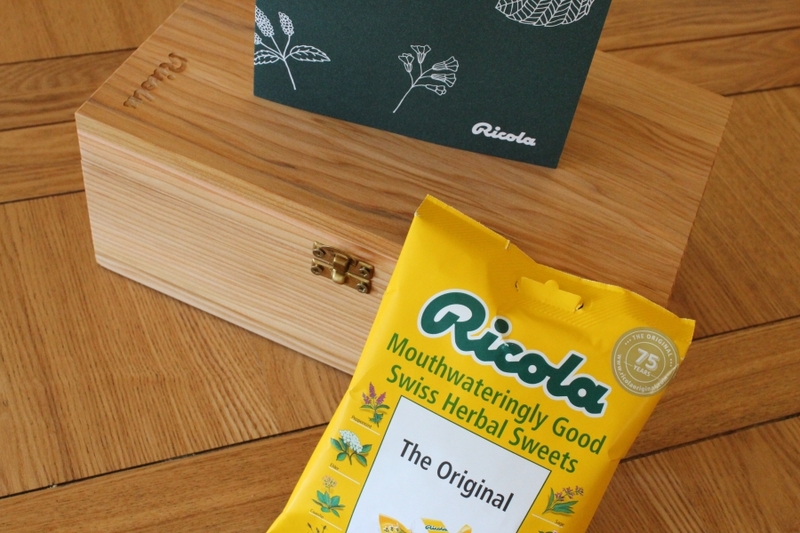 As a thank you to Ricola for including me in their 75th anniversary celebrations, please may I ask that you click-through and take a look at their website? And don’t forget that sweepstake! We have Ricola sweets here, and I have enjoyed them for many years; most especially because there are no ‘funky’ ingredients in there. Hope your sore throat is feeling better – how lucky you are to now have lots of Ricola on hand. I have never been to Switzerland, but it’s on our retirement to-visit list. You might enjoy some of my Swiss posts – when I’m not in the Black Country lol!